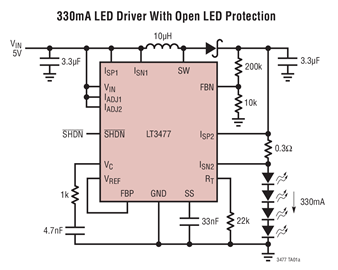 Most quality COB LEDs are driven with around 35V. Are there any quality constant current step-up drivers available that allow a 3.7V Li-Ion battery to be used? Or would I have to use TI's WEBENCH POWER DESIGNER to obtain a circuit, source the components, and solder it myself? I am not a circuit designer, so any help would be much appreciated. I think I want to attempt building the circuit myself, so hopefully that re-validates the question. I have found the IC LT3477 from Analog Devices that seems to accept 3.7V Li-Ion input and can step up/boost to 35V. I hope I understood the data sheet correctly. Please see a sample schematic below. Which components would I need to change to obtain 180mA or 360mA constant current? I saw from https://electronics.stackexchange.com/a/335325/207467 that there is a "feedback" or "sense" resistor that apparently needs to change with respect to the IC's reference voltage. Another alternative I found to devise my own circuit is the TPS61169 http://www.ti.com/product/tps61169?qgpn=tps61169 with max. 400mA, where the current is adjusted via an "external sensor resistor". How would I calculate that resistor's value to drive a 90mA, 180mA or 360mA LED? If I knew how that is to be done, I could build my circuit with that part. An even better solution turned out to be the TI LM3410 as a SEPIC device, as shown in the documentation under 8.1.2. That works well with a 3.7V Li-Ion battery as it discharges from 4.2V down to 2.9V with the LED Vf in between - and that little inexpensive IC also boosts 3.7V well to 9V without too much heat, so many other LEDs come into range. I found the answer reg. calculating the "sensing resistor" for such boost ICs. In case of the latter one, it is in the application note "8.3.4 Current Program". Now I only have to find a suitable inductor and hope that the suggested schematic will work. Not the answer you're looking for? Browse other questions tagged led power-electronics lithium-ion boost step-up or ask your own question. How can I feed the right current to a superbright LED with a 3.7V LiPo battery? 3.7V to 9V DC to DC boost step-up converter design help!